What is Warriors at Ease Teacher Training? The development of our curriculum began in 2006 when our co-founders and lead faculty were part of early research funded by the Department of Defense (DoD) and the Department of Veterans Affairs (VA) that studied the effects of yoga as adjunct therapy for Post Traumatic Stress Disorder (PTSD) at Walter Reed National Military Medical Center and the Washington D.C. VA Medical Center. Since then, our curriculum has continued to evolve thanks to the contributions of dozens of clinicians, veterans and experts in the field of yoga and meditation. Our training, which is comprised of two parts, has been recognized by DoD, VA and leaders in the yoga and meditation communities. Level 1 is an online, self-paced course, and Level 2 is an in-person teacher practicum. 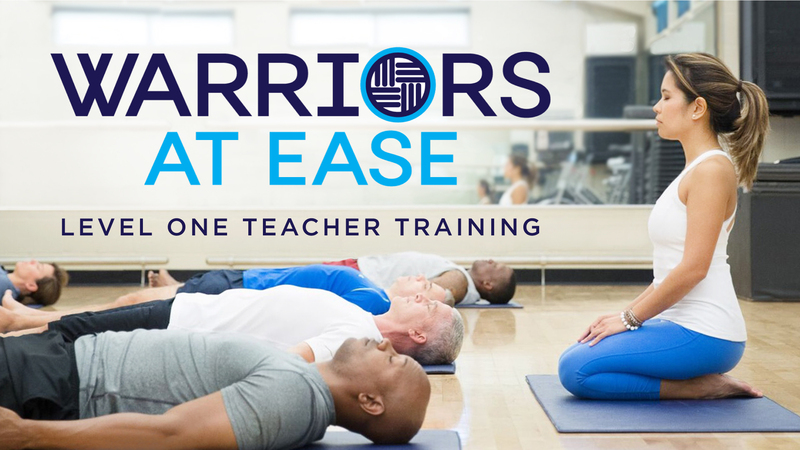 To learn more about how to become a Certified Warriors at Ease Teacher and part of our worldwide network of teachers, click here. Warriors at Ease has trained an expanding network of over 1,100 yoga and meditation teachers across the globe! The Warriors at Ease Level I Teacher Training is an online, self-paced course available through Yoga International. In this training, participants learn valuable mind-body skills to support the health and healing of service members, veterans, and their families, including those who’ve been impacted by war and sexual trauma experienced while serving in the military. This online training was created in partnership with Yoga International. Thanks to Yoga International and other valued partners, scholarships are available for service members, veterans and military/veteran spouses. Click here to apply. This course is 30 hours of continuing education for Registered Yoga Teachers through Yoga Alliance. 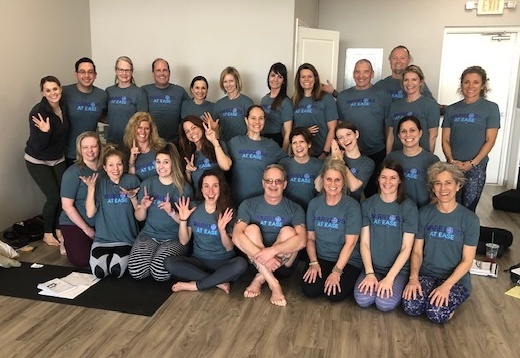 This course, when taken in conjunction with the in-person WAE Level 2 training (see below), is 50 hours of Approved Professional Development for the continuing education of Certified Yoga Therapists via the International Association of Yoga Therapists (IATY). 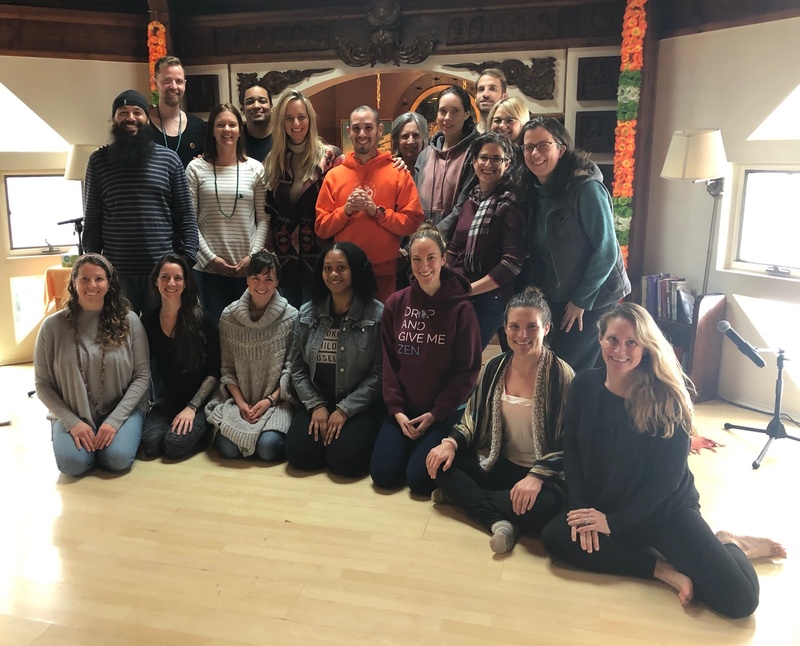 The Warriors at Ease Level 2 Teacher Training is an in-person training opportunity for yoga and meditation teachers who’ve completed the Warriors at Ease (WAE) Level 1 Training to advance their skills through practice, self-study and coaching from our experienced Warriors at Ease faculty. Upon the successful completion of this in-person training and subsequent assignments, trainees will become fully certified Warriors at Ease Teachers. If you’re a care provider or a yoga/meditation teacher who does not meet the minimum requirements listed, you may be able to attend by exception upon faculty approval. Please contact our registrar at reg@warriorsatease.org. Have foundational training in yoga and/or meditation (as listed above) unless otherwise approved by a faculty member. *If you are a WAE teacher who has previously attended a Level 1 training but have not yet completed the NEW Level 1 online training available through Yoga International, you must register for this course, review the portions of the online training fills any gaps in your previous training, and complete the assessment at the end. Current WAE teachers (anyone who has previously taken a WAE course) may apply may for a significant discount on this training by clicking here. Review and be assessed on your understanding and competency of the Guidelines for Teaching a WAE Trauma-Sensitive Yoga/Meditation Class as presented in Warriors at Ease Level 1.
Review the concepts of Moral Injury and Post Traumatic Growth and learn a specific model to support healing and transformation. Yoga teachers will learn and practice trauma-sensitive asana sequence protocols and posture modifications which are suitable for able-bodied veterans and individuals with limited mobility. Meditation teachers will learn and practice trauma-sensitive techniques proven to be accessible, safe, and effective for a military/veteran population. Yoga and Meditation teachers will learn and practice teaching the WAE Health & Resiliency Practices (HRPs) and be guided on how to use HRPs in a class or workshop setting. Learn how to initiate, market, and grow a yoga and/or meditation program for warriors with the support of the WAE Teacher Network. Learn about key studies, emerging research, and initiatives within the Department of Defense and Department of Veterans Affairs which are helping to advance yoga and meditation in military and veteran communities. Practice iRest Yoga Nidra and other trauma-sensitive meditation techniques for self-care. Participants in this training will review and practice how to integrate the WAE Guidelines for Teaching a Trauma Sensitive Class (as presented in the Level 1 training) into their teaching style in order to best serve the population they intend to support/are currently supporting. The teacher practicum involves a faculty evaluation and coaching (based on the WAE Guidelines) as well as peer mentoring. Yoga teachers serving those with limited mobility (such as amputees or individuals in wheelchairs) will focus on adaptive yoga/meditation practices. Yoga teachers serving an able-bodied population will focus on trauma-sensitive techniques that support resiliency, injury recovery and prevention, as well as performance enhancement. Meditation teachers will focus on how to effectively adapt the practice in which they’ve had formal training and experience to any military/veteran population as well as learn and practice additional techniques proven to support the health, healing and post-traumatic growth of warriors. This course is 24 hours of continuing education for Registered Yoga Teachers through Yoga Alliance (20 contact hours and 4 non-contact hours). This course, when taken in conjunction with the in-person WAE Level 1 online training (see above), is 50 hours of Approved Professional Development for the continuing education of Certified Yoga Therapists via the International Association of Yoga Therapists (IATY). 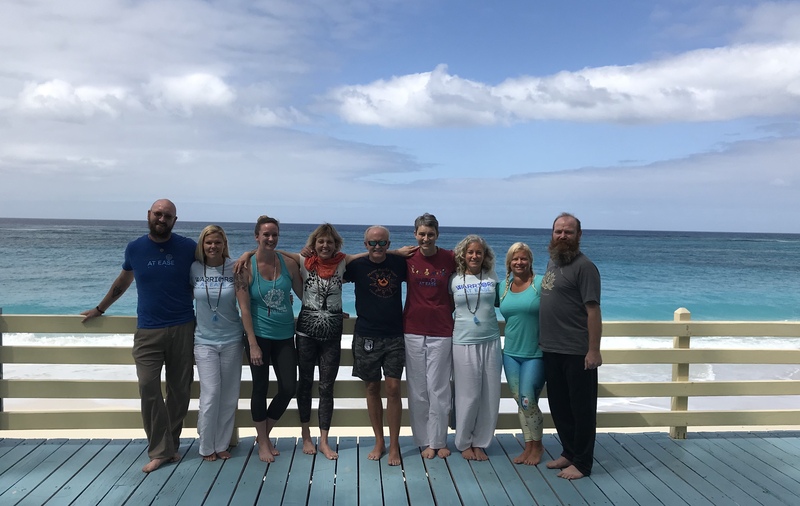 For teachers who want to attend an in-person training for both Level 1 and 2, we offer a combined course, once a year at the Sivananda Ashram Yoga Retreat in Nassau, Bahamas. If you have extensive experience as a teacher but don’t meet the minimum requirements, you may still qualify upon faculty approval. Please contact our registrar at reg@warriorsatease.org. Those who demonstrate the core competencies of both Level 1 and 2 and complete the self study portion of this training will be prepared to share yoga and/or meditation safely and effectively in military and veteran settings – including clinical and non-clinical environments – and become certified Level 2 Warriors at Ease Teachers. Sivananda Ashram, partially staffed by veterans from around the world, creates a meaningful setting for our training. Additionally, the discipline, ritual, and community of the ashram provides a unique context in which to dive deep into Warriors At Ease Teacher Training. This training is a total of 50 contact hours of continuing education for Registered Yoga Teachers via Yoga Alliance. The course is also 50 hours of Approved Professional Development for the continuing education of Certified Yoga Therapists via the International Association of Yoga Therapists (IAYT). Our Train the Trainer Program is for teachers interested in learning how to facilitate a retreat, using trauma-sensitive, evidence-based practices! Retreats can be a powerful vehicle for learning and growth. 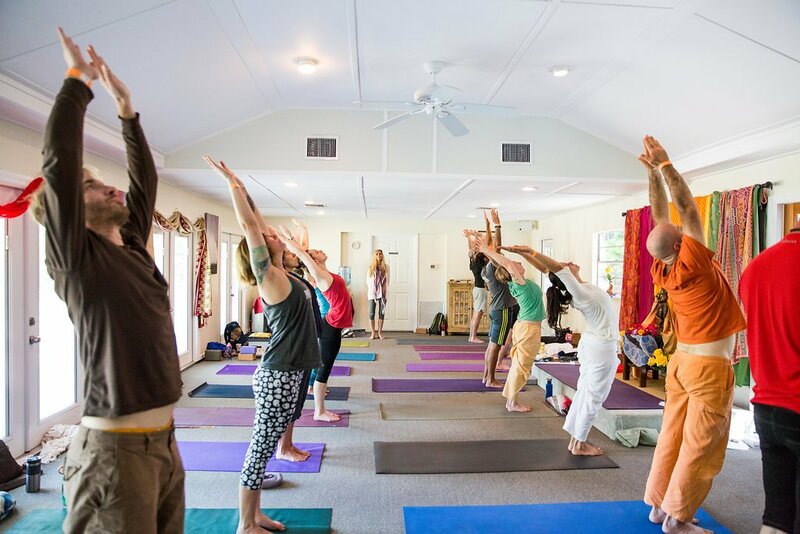 Retreats offer students the chance to shed routines and responsibilities, to enjoy the healing power of nature, to experience belonging in a safe community, to dive into supported self-reflection and to immerse themselves in yogic teachings and practices. Facilitating a retreat effectively requires a carefully honed curriculum and advanced group facilitation skills. Warriors at Ease is excited to offer a Train-the-Trainer program that offers teachers the chance to learn both of these key components in a weekend training. After this training, attendees will be ready to lead WAE-style retreats for active duty service members, veterans, military families and healthcare providers. Attendees will also be able to use the same curriculum and leadership skills to lead retreats with civilians suffering from stress, first responders, therapists, those who have experienced sexual trauma and more. In short, most human beings from teens to elders can benefit from taking a retreat and learning from these teachings. After taking the Train-the-Trainer program, you’ll be ready to share this knowledge with them. In addition, you will also receive a teaching manual, student handouts and a retreat planning checklist. This Train-the-Trainer program is for any Warriors at Ease teacher who would like to learn how to deliver a tested and successful retreat format — which includes lectures, community building exercises, group facilitation and evidence-based practices. September 27, Friday: 6 p.m. to 9 p.m.
September 28, Saturday: 9 a.m. to 6 p.m.
September 29, Sunday: 11 a.m. to 5 p.m. Registration for this program is coming soon! 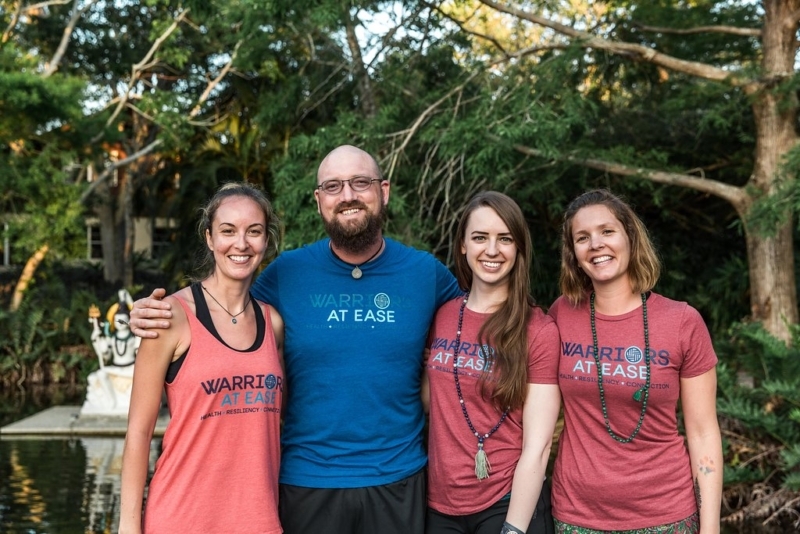 Interested in becoming part of our worldwide network of Warriors at Ease teachers? Stay informed about upcoming trainings, veteran retreats and more by signing up for our newsletter!